Hi everyone! Happy Thursday to you all! Last week, I shared all of my goals and resolutions for the year, and starting today I'm going to be breaking each of the categories down and explaining them in more detail. Today we're going to be starting with my blogging goals! I'm going to be getting a bit personal with my goals, so if talking about money and blog statistics make you uncomfortable, come back tomorrow! - Use Dan! Dan is an amazing photographer. One of his dreams is to start selling his pictures, and he really knows his stuff. He also owns a DSLR and actually knows how to use it, so I'm hoping that I can learn from him, or convince him to be my full-time photographer. I'll make him cookies or something, and I know he'll be all in. - Make backdrops. Most of the pictures on blogs that are high quality have some sort of neutral background to make the image really pop. The popular backgrounds right now seem to be wood grain and marble. Luckily, my parents had left over wood flooring from their living room renovation, so I grabbed some of that. On the reverse side, I'm thinking of doing a DIY "marble slab" background. Tutorial coming if this actually ends up looking good! 15,000 is kind of an arbitrary number, but my goal for the year is to increase my viewership. To be completely transparent, I'm currently hovering around 10,000 views per month lately (but you can see above my views are up and down and all around!). I would love to kick that number up, and hopefully continue to increase this goal number as the year goes on! - Improving photography (discussed above) and making more "pin-worthy" posts. I would love to start doing more craft tutorials and recipes. I also want to start making content that people will want to share and pin. - Increasing social media presence. I've started getting better about sharing my content on social media, but this is a big goal for 2016! I might even make a dedicated twitter or Instagram account, to make it separate from my personal account. If anyone else does this, what are your thoughts? - Better posts. The term "evergreen content" is something that I've been hearing a lot lately, and it basically means that the content continues to be relevant and stays fresh, no matter when a person reads it. Some of my favorite posts are the ones that I plan weeks or months ahead of time, so I want to get better about brainstorming ideas and planning out posts. This might even mean that I cut back my posting schedule from 6 or 7 days a week to 4 or 5 (this is all to be decided!). Money is always a touchy subject, so I'll try to tread lightly here. My end goal for this blog is not to make it my career, and I'm not looking to become a full time blogger. While that is a great idea for some people, I prefer to keep blogging my hobby. However, last year I found myself putting a lot of time and money into my blog, trying to make it as great as possible. In order to keep that up, I would like to start earning a bit of income from the blog. - Sidebar ads. This will stay the same. Pretty much since I started, I've had ads on my blog. I don't want to add more and ruin the reader experience, so I'll keep it as minimal as I can. This doesn't earn a ton of money, but is an easy way to make some cash without much work on my end. - Affiliate links. You may have noticed that I recently started adding disclaimers to some posts saying that the post contains affiliate links. I signed up for an account with Amazon Associates and Shopstyle to earn a bit of money on the links that I share. This is a very small percentage of money that I make if you click these links and purchase items. I will never share something that I wouldn't purchase myself, and I'm not going to start throwing links in every post for the sake of making a dollar or two. I want my content to be genuine and as true to myself as possible. This won't make much of a difference (hopefully) on your side, but once again will earn me a bit of cash. - Sponsored content. Last year, I did a few sponsored posts, and I will continue to do that this year when it makes sense with my blog. I've already turned down a few offers this year for products or companies that wouldn't seem genuine. My number one priority is to make sure my readers and friends know that all of my content can be trusted, so I'm forcing myself to be very picky with sponsorships. 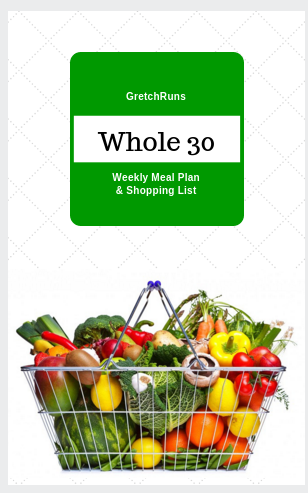 I am planning on pursuing some opportunities with a few companies that I've loved and respected for years before GretchRuns even started, so that may be another avenue of income (and a way to get my blog out there!). Done! I started my newsletter last week, and have published two so far. 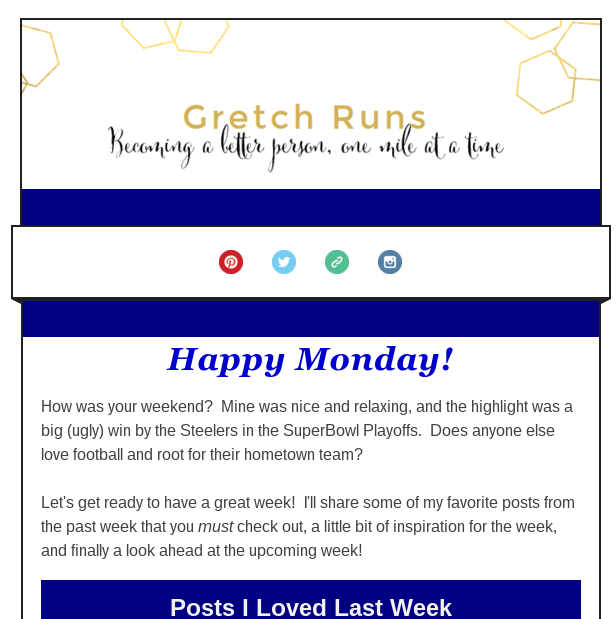 The newsletter comes out every Monday, and offers a look at my favorite posts from the previous week, some inspiration for the week to come, and a sneak peak at posts to look forward to that week. I hope to continue to develop this newsletter, and use this as an avenue to host giveaways and send special content (like the e-book! ), so make sure that you're subscribed! That's all for my blog goals! I hope that you enjoyed a little sneak peak of my goals for the year, and I would love to hear your thoughts. Next week, I'll be sharing my fitness and health goals! Good luck with blogging goals Gretchen. It's awesome you have it completely laid out and you know what you are going to do. That will only help you succeed. Love your analytical and logical approach. You are going to have no problem achieving these goals, and I can't wait to see how far your progress as a result! Heehee I guess that's why I make a good business analyst :) I like to keep everything in line haha! I think you have lots of good goals there & hope they work for you. That's a really great plan of action, Gretchen! I noticed that improving my photography and producing evergreen content were the BIGGEST contributors to my blog growth, so I definitely can't recommend those enough! Thank you! Your photography definitely inspires me :) Thanks for the insight! Best of luck to you Emily! Good goals - especially the photography. I know that's a stumbling point on my own blog, too, but it's very hard to take good photos sometimes! Between equipment, know-how, and a simple lack of good locations/lighting, getting the right photo can be a real pain. Good luck with everything! I think that's where a lot of people struggle, which is why the blogs with good photography really succeed and stand out. Thank you, and good luck to you too! This was awesome, Gretchen! I really love how detailed and thorough you are! For me, I also don't have pin-worthy photography so I depend a lot link-ups and SEO are my top growth methods. As for social media improving traffic...it does somewhat so I think it's worth having accounts that are separate from your personal. Instagram is also a great way for companies to find you (I get contacted by at least 10x more companies since I joined), which can help with the "earning money" segment. Anyway, great post and I love your organization and ambition! lots of luck with your goals. i am working on my photography, too!! Girl your photography is already amazing! Great goals, good luck! I should really write mine down to hold myself accountable, but photography is a big one this year for me (ditto for "pinable" posts)- I just got my first DSLR so hopefully after I learn to work it, photos will improve. I have a separate insta account from my personal one. My personal one is pics of the hubs, traveling, friends, etc. and my insta one is workout and food related stuff. I think it works well because I know some of my friends in real life do not what to see what I ate for breakfast lunch and dinner. I try to post on my blog insta account at least once a day. Feel free to shoot me an email if you ever wanna bounce ideas/suggestions off each other! Good luck learning the DSLR! I'm so lucky to have Dan help me figure it out since he knows all those technical things like aperture and exposure. Great advice on separating the accounts! Such great goals! I have what feels like a giant list of blog goals for the year, but a lot of mine are similar to yours! I would love to hear progress updates as the year goes on! I'll update you every month!! Very interested to see how these goals pan out & how you feel they help your blog. Will one help you more than the other? Hard to tell. And also refreshing to hear about someone that just wants to keep blogging a hobby. I feel like everyone is busy trying to make it their full time job. Nothing wrong with that, just not realistic or a goal everyone has. Great goals, Gretchen, and I love your transparency and honesty! I feel that a lot of bloggers don't talk about these things, but I find them fascinating and really wish you the best of luck on these - I know you'll achieve them and beyond. Pinterest was HUGE for growing my pageviews. When I started investing more time on Pinterest and optimizing my images (the 600 x800 or 800 x1200 ratio is magic! ), my monthly pageviews shot up to the 40K+ and growing mark. I've had great luck with Gourmet Ads for my sidebar ads - they pay really well and there's no minimum earning to get a monthly payout, unlike Google. Shoot me an email if you want a referral link! Lots of great goals. Mine are still baby steps, all focused on putting this injury behind me and being able to enjoy running pain-free. That's a very important goal to have! I have a DSLR too and would be happy to meet up with ya for photos! 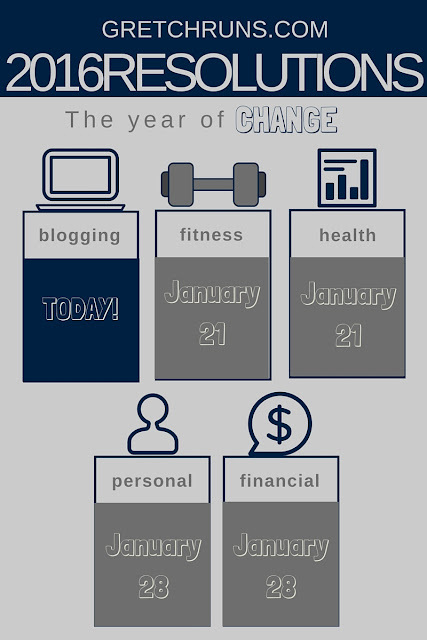 It's great to set yourself up with your goals for the blog for the year. I hate photos and cameras but they are so key it's definitely worth learning more about. I agree..they're just not my thing. Dan is more than willing to help in that area luckily! All I have is my phone so I can't improve my pictures at this time. Good luck with your goals! Thank you! There are some great tutorials out there for taking better pictures with your phone, so I think you could still work on improving if you want to! Hey, this is great! Thank you for putting it out there and being transparent. That's why everyone loves you because we relate to you. You're not some "out there" unreachable person who's all blah blah blah. Authentic, caring, all the good stuff. Love it. Arrrg I think I just lost my whole comment. Sorry if this is a repeat. Anyway, you're lucky that your SO is good with a camera! Anytime I try to get my bf's help, I end up just getting irritated with him. :P This is why I set up a tripod or hire someone, lol. I hope it goes well for you! Also on photography: I found a sheet of thin white board from Home Depot for $10 that I've started using as a backdrop. It was extremely large (found it with the plywood) but I had them cut it down so I could fit it in my car. Even just with an iPhone, it looks a LOT nicer than my desk, table, or carpet. Lastly, on monetizing, I don't think there's any shame in wanting to be paid for your time, even if it's just a pittance. Yes, blogging is fun, but it can also be very hard work, and you need some incentive to keep pouring in hours week after week, since that's time you could be spending doing something else (reading, with friends, etc). Btw, feel free to email me if you have questions or want advice on any of that. I know it was really confusing for me for a while. Thanks so much for your advice Suzanne! Your pictures have been SO good lately, which is one of my inspirations to use Dan as my "photographer". I might have to get some modeling advice from you ;) And thank you for the part at the end..it's something that I feel a bit uncomfortable admitting..but then I think about how I spend close to 24 hours a week on the blog, on top of a 40 hour work week..and I think I deserve a little something! I'm so excited to watch your blog grow this year! I also laughed when you said you'd bribe Dan with cookies haha I love it. He would do just about anything for an Oreo! GREAT goals, my friend! My goal the last half of 2015 was to get a DSLR and learn how to use it :) I feel like I have a long way to go, but it's been fun to practice so far!! Thank you Jess! Your photographs are already really improving, so great work!! Great goals! I'm with you on side bar ads! I need to switch to a hosting site first! Happy to have you part of this! Great plan for growing your blog! I've also been thinking a lot about my blog's direction and will be doing a post soon noting the changes I'll be making. As for the social media accounts, I wondered about that myself. I am really bad with keeping up with any social media other than blogging, though, so I just don't think I can keep up with different accounts. But it seems like a good strategy? Oh, and a tip for Dan on selling photos. My husband has had photo exhibits and has sold a lot of his photos, but the selling has been through no work on his part! He has a Flickr account, and people and companies find his photos through his tags and offer to buy the the photos (or, in some cases, he gives them away for smaller companies and non-profits). So just be sure he's using Flickr and tagging appropriately! I'm excited to see the new direction of your blog! Thank you for the tip on selling pictures..he doesn't know where to get started so that's REALLY helpful! Backdrops are such a fun idea, I've found lots of DIYs for them on Pinterest! I'll have to finally get around to making one this year! oh that's so awesome that Dan is a great photographer - see if he will come take my photos? i don't do cookies, but i can buy some lol. good luck with all your goals, you can do it!